Well Flat Aggie came for a visit - we had a great time! When he first arrived we sat down around the kitchen table and got to know each other! We welcomed him to Central Indiana - and I mean right in the middle of the state - Franklin, Indiana! We told him we were a grain and hog farm! We raise corn, soybeans and wheat. We also have a farrow to finish hog operation - that means that we have sows (momma pigs) on our farm who give birth and then we raise those piglets until they weigh enough to be sold to a packer. Our hogs are raised in confinement barns - that means that they are always indoors in climate controlled conditions for their comfort. We then let him tell us a little about himself! He told us he was visiting from Kansas and was here to learn about hogs. He also told us he was visiting from Mrs. Leiker's second grade class! I was surprised and asked if he knew Maddix - Flat Aggie was left speechless when I told him that last summer Maddix has stopped for a short visit at our farm with his family! 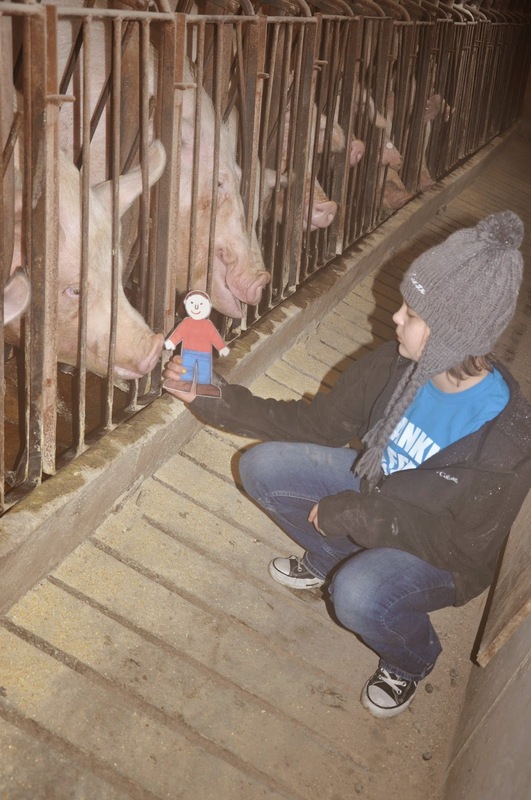 So we took Flat Aggie down to the hog barns and showed him our operation! We started in the farrowing barn - this is the barn where the baby pigs are born. We use gestation crates - this allows for us to monitor each sows feed and health but also gives her space of her own and her piglets space to sleep without the risk of her laying on them accidentally. Baby pigs are given a mat to sleep on and a heat lamp for warmth, they still have constant access to their momma for 100% of their nutrition. 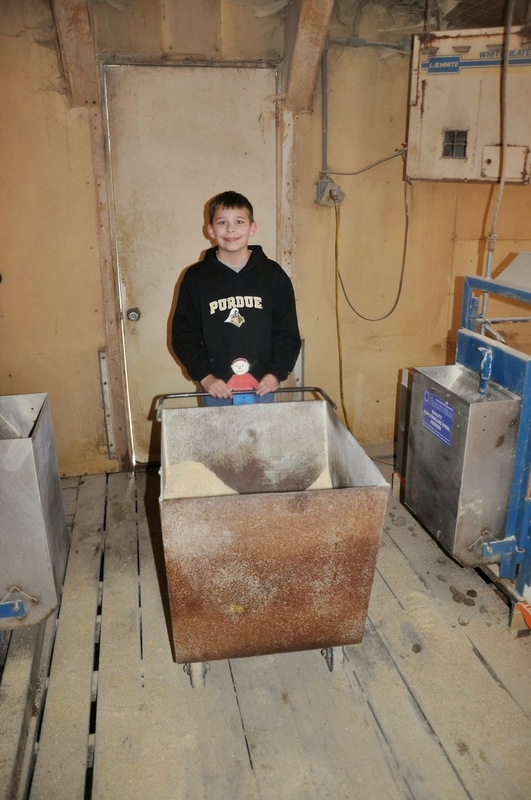 The sows are fed twice a day - their feed is ground on our farm and is a combination of corn, soybean meal (which is ground soybeans with most of the oil removed leaving the flour, which is high in protein) and vitamins and minerals specific to nursing sows. Flat Aggie loved watching the piglets run around and play - and of course wanted to pet one! We also keep records on all our sows- each sow has an ear tag with a specific number - we record the number of crate that she is housed in and then record the date she gives birth, the number of piglets she has and when those piglets are processed - meaning when they were given the newborn once over check and shots. Next we showed him our nursery rooms - when piglets are almost 4 weeks old we wean them. That means to take them off of the mothers milk and put them on full feed and water. 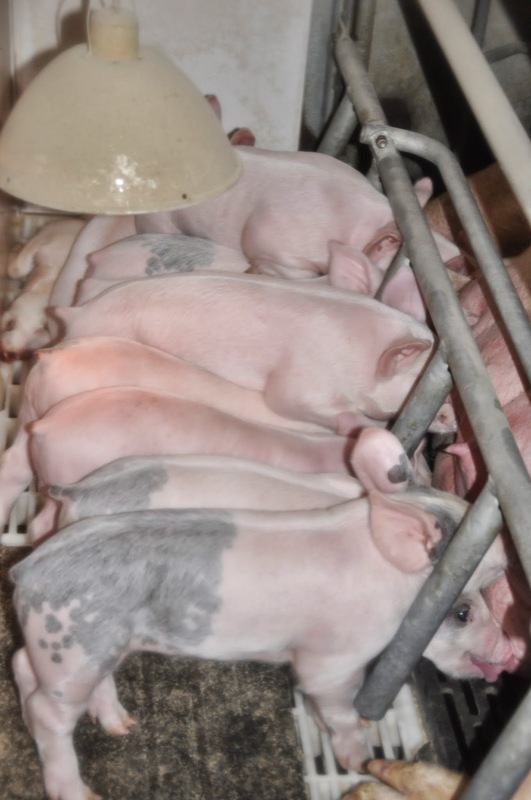 Pigs will stay in the nursery for about 5 more weeks - they will come into the nursery weighing approximately 15 pounds and when they are moved into the finishing barns they weigh right around 80 pounds. 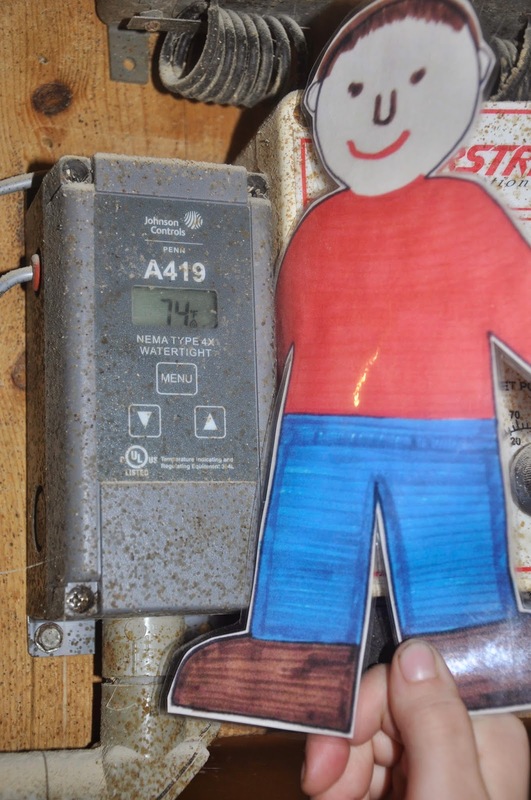 Flat Aggie helped check each waterer and make sure the feed was flowing in each feeder in the nursery! 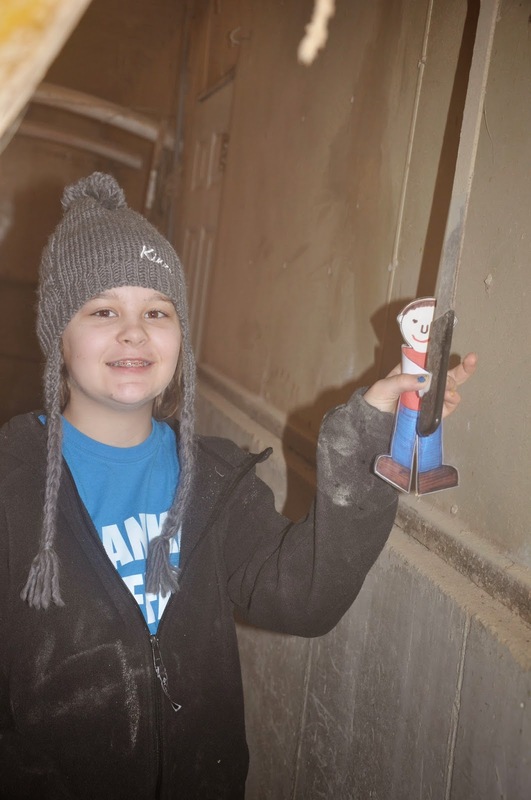 We also told Flat Aggie to check the thermostats - it has been cold here in Indiana but the pigs are always kept at a constant temperature in our barns! I made sure I told him that our barns are warmer and kept at higher temperatures in the cold of winter than our home - You and I can put on a sweatshirt or snuggle under a blanket if we get cold, our pigs can't so it is important to keep the temperatures warm and steady for them all winter. While Flat Aggie was visiting he got to help us vaccinate a group of nursery pigs! 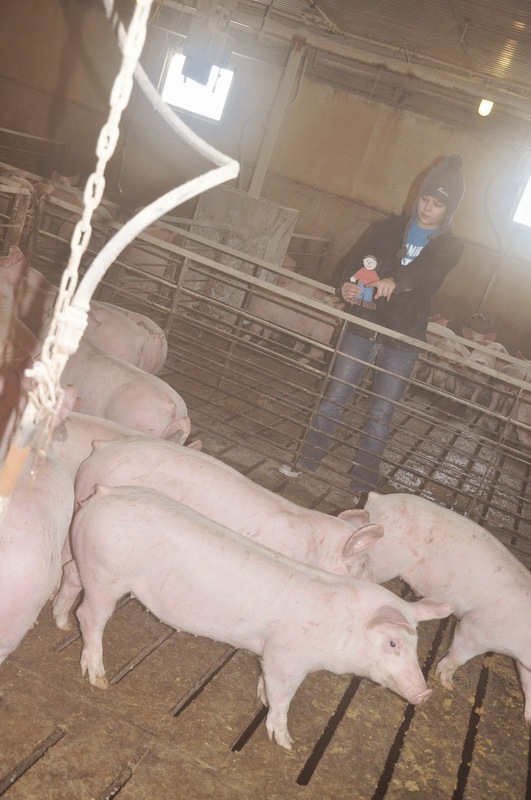 When the pigs are 6 weeks old they each get a shot to help protect them from certain illnesses. When the pigs are about 10 weeks old we move them into the finishing barn. They have more space and are fed a different ration of feed to maximize their growth. Once moved into the finisher they will stay here till they are about 6 months old - by then they weight around 280 pounds and are ready for market. The last stop on our tour was our gestation room - here is where we keep the sows while they are pregnant - this type of housing allows each sow her own space, she doesn't have to compete with other sows for feed and water and allows us to keep a closer eye on her individual health and care. 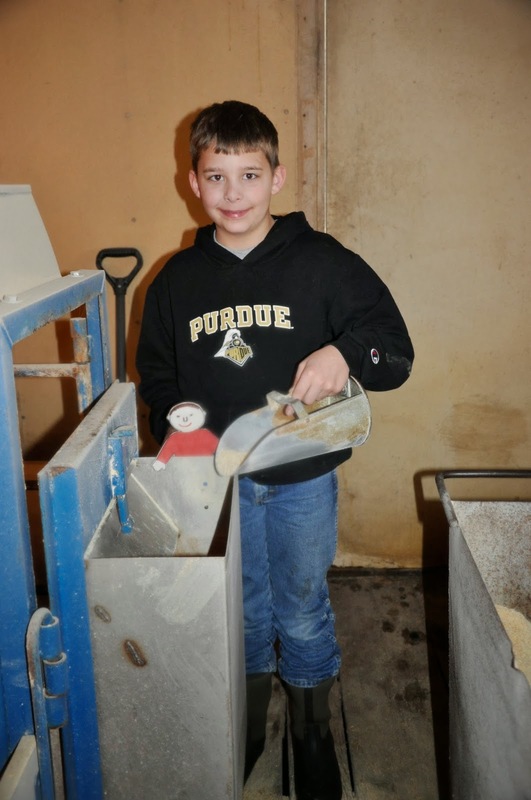 Here Flat Aggie got to help feed - this lever releases all the individual feed tubes to each sow in our gestation barn. Flat Aggie got a huge treat - he happened to be down at the barns on the day that they got the John Deere 720 out to start it up and let it run - we are working on restoring it. 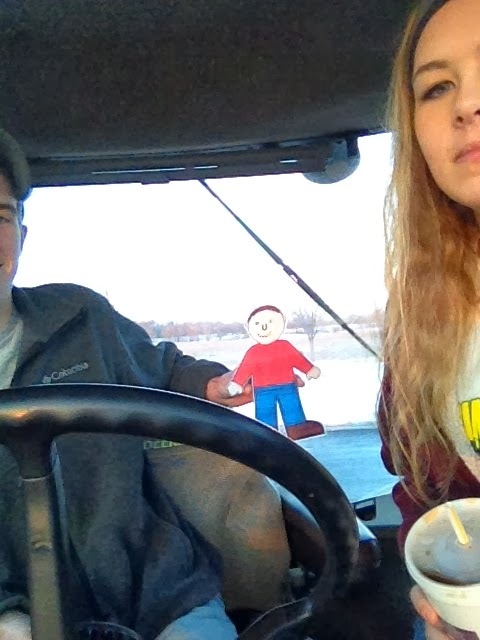 I extended Flat Aggie's visit just a few days because I wanted him to help us celebrate National FFA Week with us! 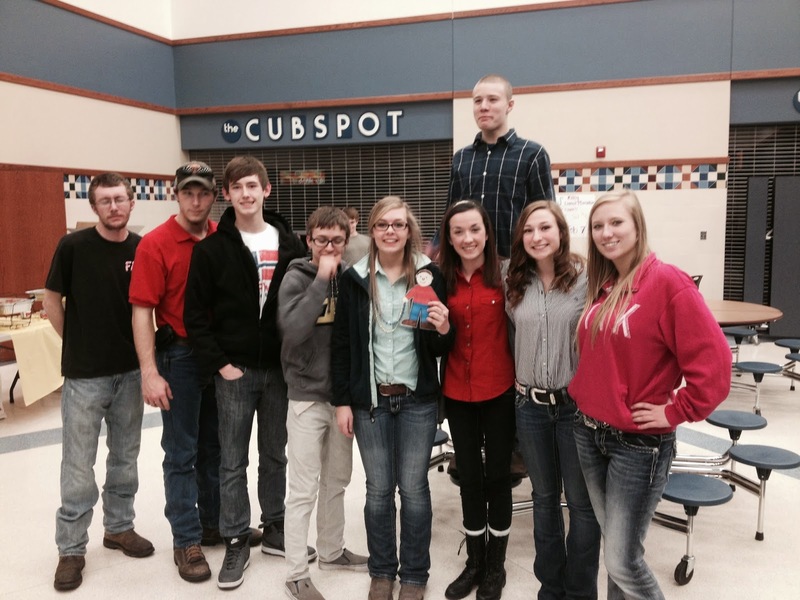 Last night he got to attend the Spaghetti Supper and have his picture taken with Franklin FFA's Officer Team! And this morning he got to drive one of the tractors to school for tractor day! Thanks so much for letting Flat Aggie come visit us, he is welcome any time!! He certainly got the VIP tour, and he didn't even have to wear the booties we humans have to wear when we visit! 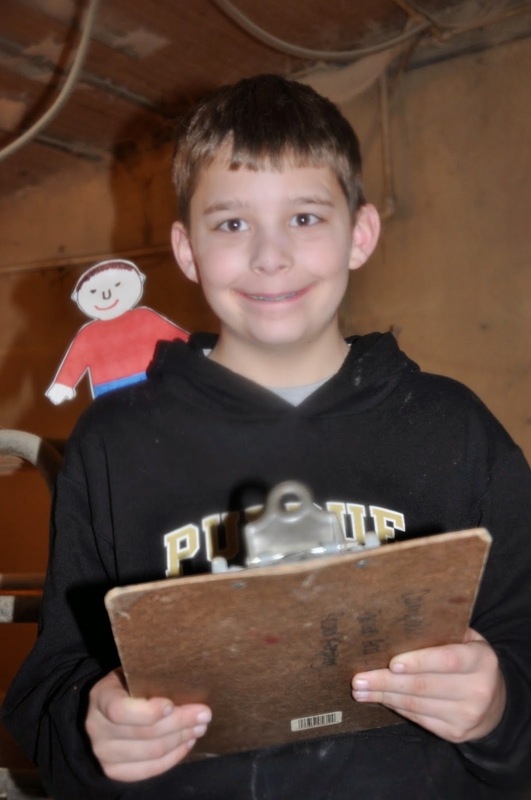 Fantastic visit to the farm from Flat Aggie! Thank you for inviting us to visit too! Great job Jent and Flat Aggie! Always enjoy the adventures and the places that Flat Aggie goes. Flat Aggie looks like he had a great time! I think he and I also might have learned some things too! How fun! Thanks for posting this... 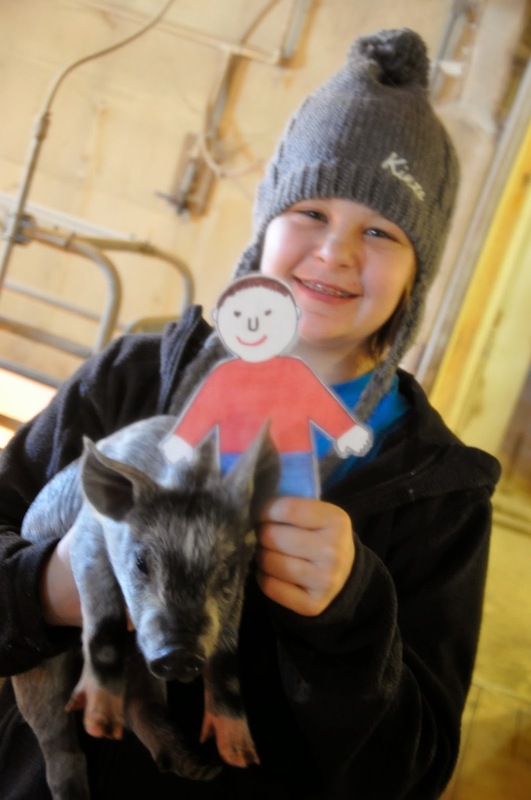 I learned more about hog farming right along with Flat Aggie!